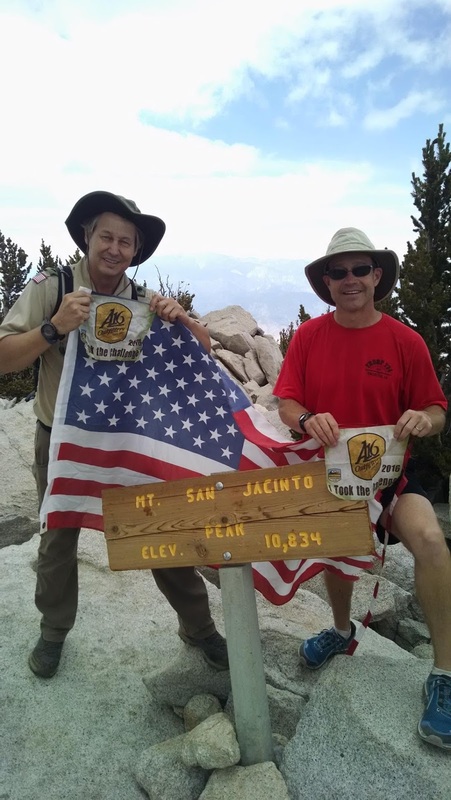 For Memorial Day, we hooked up with Troop 782 to attempt A16's 3 Peak Challenge. 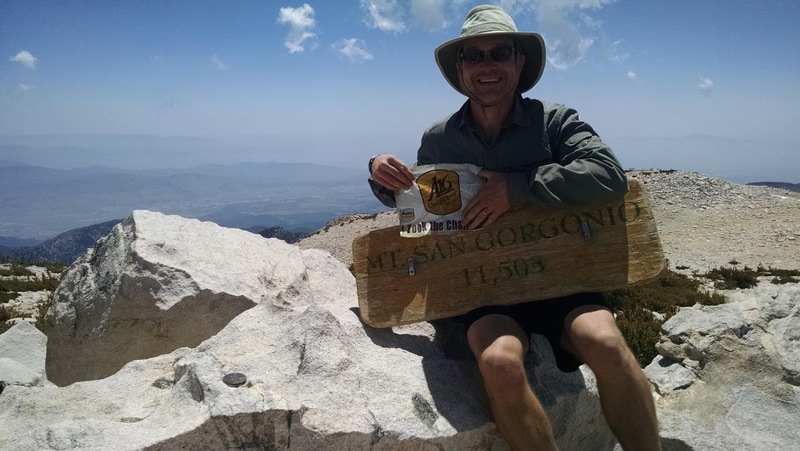 The challenge involves summitting San Jacinto, San Antonio (aka Baldy) and San Gorgonio. There are different times allowed but we were going to do it over 3 days. First on the list was Jacinto and we drove up on Friday night to the Seven Pines trailhead. There is a yellow post campsite there. Unfortunately it was already taken by some noisy drunk yahoos. But we set up camp in near the trail sign for the night. The next morning, we all got on the trail by 7:30. Seven Pines is not really maintained and no one in the group had hiked it before. We had some trouble in spots locating the trail but there was lots of ducks to help out. The trail crosses Dark Canyon creek a few times before hitting the PCT/Deer Springs Trail. From there it was a long haul uphill to the summit. Many in the group were struggling due to the distance and altitude. Once on the summit, we took our required pictures with the A16 flag and then started heading down the same way. The last couple miles seemed to take forever but our troop got the cars around 6pm. Bengt left with Torti's while I waited an hour for troop 782 to make it down. It was much later than was planned so rather than head over to Baldy, we decided to eat in Idylwild. Unfortunately almost everything was already closed but ended up getting some good pizza at the Idylwild Pizza Company who were good enough to stay open. Finding a place to camp, we drove to the nearby state park but it was full. So we decided to head back to the Seven Pines site and our raucous friends. The next morning, we headed out for Baldy. We made a stop at Subway to get sandwiches for the trail and thankfully a doughnut shop was right next door. I have discovered that maple bars are great pre-hike meals even though they are anti-paleo! We got to the trailhead at the optimal time as the early hikers were done and starting to leave. That opened up some prime parking spots within yards of the starting line. Hiking up to road to Baldy Notch, a couple of us went fast and got to hang out at the lodge for a while. After everyone made it up, we ate lunch then headed out. The first mile or so up Devils Backbone is a horrible slog up ski runs. After that, then next few miles along the knife edge were great hiking. The summit push was steep but short and we all made it in good time. After some discussion, we decided to head down the Baldy Bowl Trail to save time. Shortly after reaching the ski hut, thunder pounded down from the summit. I think it was good did not take the Devils Backbone as it might have been pretty dicey up there. After getting to the cars, we went to Manker Flats campground and grabbed a spot. Then we headed to Mt. Baldy Lodge for giant burgers and some cool live music. I tore through a double grubby and was still a bit hungry! But we had to get back to camp since he had an early rise in the morning. Waking before 5, we broke camp and drove to Vivian trailhead, stopping for gas and breakfast at Jack-in-the-Box (we had lots of non-paleo eaters). We were on the trail at 7:20 and started the long slog up to Vivian Creek camp. After that, it was cruiser all the way to High Creek. By now, the scouts were starting to wear out and we had to keep encouraging them. After a break at High Creek, we slogged up to the ridge and then up Turd Hill. With the summit nearly in view, the pace was quickened until we all made it! After pictures, we headed down and everyone was going much faster. We stopped for water at High Creek. Along the trail down one scout got bad altitude sickness and I smacked my head on a low branch. We finally made it to the cars after 12 hours of hiking. A couple cars went to eat dinner in Mentone while the other left for home. Overall, we did 42.2 miles and 13,000 feet of elevation gain. I am super proud of everyone made it. 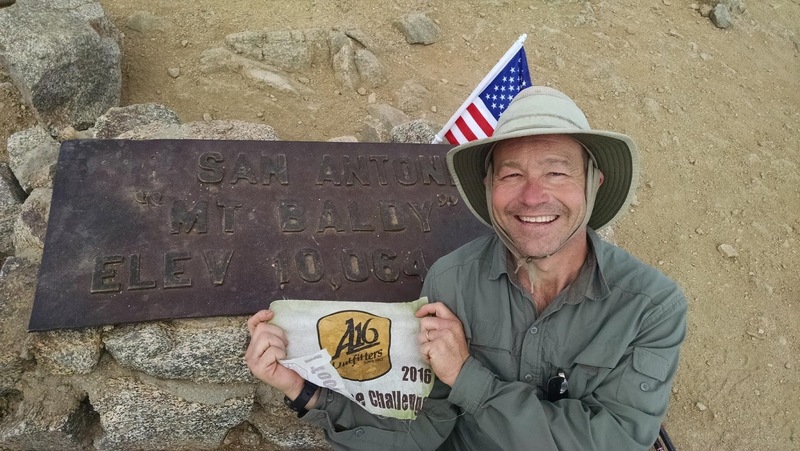 You can check us out on the 2016 3 Peak Challenge finishers page.